Ms. Mastracchio-Lafontaine has been a member of the Users’ Committee at the MUHC since 2006. Additionally, since 2005, she has brought her creativity, energy and patient’s perspective (she lives with MS) to a variety of roles. Ms. Mastracchio-Lafontaine has served as a board member for the Research Institute of the MUHC and is currently a member of the advisory board of the Action Centre. 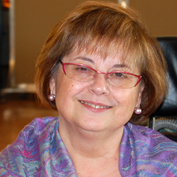 In 2007, Ms. Mastracchio-Lafontaine co-developed the MUHC’s My Tool Box, Québec’s only version of the world-renowned chronic disease self-management pro-gram. Between 1972 and 2003, Ms. Mastracchio-Lafontaine made a lasting impact as an elementary school teacher. In 2000–2001, she was recognized with the Prime Minister’s Awards for Teaching Excellence’s Certificate of Achievement.